VINALHAVEN, Me. 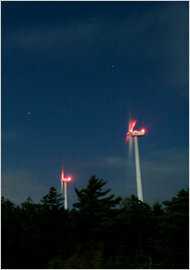 - Like nearly all of the residents on this island in Penobscot Bay, Art Lindgren and his wife, Cheryl, celebrated the arrival of three giant wind turbines late last year. That was before they were turned on. Residents living less than a mile from the $15 million wind facility in Vinalhaven, Me., say the industrial whoosh-and-whoop of the 123-foot blades is making life unbearable. "In the first 10 minutes, our jaws dropped to the ground," Mr. Lindgren said. "Nobody in the area could believe it. They were so loud." They are among a small but growing number of families and homeowners across the country who say they have learned the hard way that wind power - a clean alternative to electricity from fossil fuels - is not without emissions of its own. "The quality of life that we came here for was quiet," Mrs. Lindgren said. "You don't live in a place where you have to take an hour-and-15-minute ferry ride to live next to an industrial park. And that's where we are right now." Last year, the American Wind Energy Association, a trade group, along with its Canadian counterpart, assembled a panel of doctors and acoustical professionals to examine the potential health impacts of wind turbine noise. In a paper published in December, the panel concluded that "there is no evidence that the audible or sub-audible sounds emitted by wind turbines have any direct adverse physiological effects." In the Vinalhaven case, an audio consultant hired by the Maine Department of Environmental Protection determined last month that the 4.5-megawatt facility was, at least on one evening in mid-July when Mr. Lindgren collected sound data, in excess of the state's nighttime sound limits. The developer of the project, Fox Island Wind, has contested that finding, and negotiations with state regulators are continuing. In the moonlit woods behind a neighbor's property on a recent evening, Mr. Lindgren, a retired software engineer, clenched a small flashlight between his teeth and wrestled with a tangle of cables and audio recording equipment he uses to collect sound samples for filing complaints. At times, the rustle of leaves was all that could be heard. But when the surface wind settled, a throbbing, vaguely jetlike sound cut through the nighttime air. "Right there," Mr. Lindgren declared. "That would probably be out of compliance." Maine, along with many other states, puts a general limit on nighttime noise at 45 decibels - roughly equivalent to the sound of a humming refrigerator. A normal conversation is in the range of 50 to 60 decibels. Turbine noise can be controlled by reducing the rotational speed of the blades. But the turbines on Vinalhaven already operate that way after 7 p.m., and George Baker, the chief executive of Fox Island Wind - a for-profit arm of the island's electricity co-operative - said that turning the turbines down came at an economic cost. "The more we do that, the higher goes the price of electricity on the island," he said. A common refrain among homeowners grappling with sound issues, however, is that they were not accurately informed about the noise ahead of time. "They told us we wouldn't hear it, or that it would be masked by the sound of the wind blowing through the trees," said Sally Wylie, a former schoolteacher down the road from the Lindgrens. "I feel duped." "It would seem to be time for the wind utility developers to rethink their plans for duplicating these errors and to focus on locating wind turbines in areas where there is a large buffer zone of about a mile and one-quarter between the turbines and people's homes," said Mr. James, the principal consultant with E-Coustic Solutions, based in Michigan. Vinalhaven's wind farm enjoys support among most residents, from ardent supporters of all clean energy to those who simply say the turbines have reduced their power bills. Deckhands running the ferry sport turbine pins on their hats, and bumper stickers seen on the island declare “Spin, Baby, Spin." "The majority of us like them," said Jeannie Conway, who works at the island's ferry office. "I remember the sound of silence so palpable, so merciless in its depths, that you could almost feel your heart stop in sympathy," she said. "Now we are prisoners of sonic effluence. I grieve for the past." An earlier version of this article referred incorrectly to the composition of wind turbine blades. They are typically made of fiberglass or some sort of carbon-fiber-reinforced plastic, not steel.